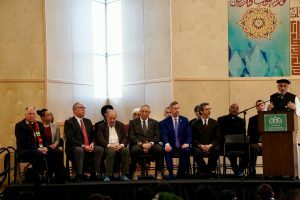 On March 15, 2019, members of the Multnomah County District Attorney’s Office gathered with faith, civic, law enforcement, and allies at the Muslim Educational Trust in Tigard, Oregon to stand in solidarity and to reject all forms of violence after the terror attacks on two New Zealand mosques killed 50 people. “My thoughts and prayers are with the entire Muslim community, our shared community, those in New Zealand and beyond. This most recent tragedy compels us to continue to come together to speak out and take meaningful action to condemn racism, bigotry, Islamophobia, xenophobia and all forms of hate conduct, speech and violence,” Multnomah County District Attorney Rod Underhill said in a statement. There is no place for violence. We reject it in the strongest terms possible. These appalling acts clearly demonstrate that we must do more, at all levels, to fight ideologies of hate and bigotry. We are united as a community that celebrates our differences, and we embrace tolerance for all. While our hearts break for New Zealand today, we strengthen our resolve to protect and care for one another. Compassion and respect will always silence hate. 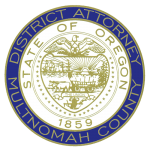 The Multnomah County District Attorney’s Office works closely with its law enforcement partners to aggressively prosecute hate crimes, and we proudly participate in the Attorney General’s Hate Crimes Task Force. Nothing is more important than keeping our community safe for everyone. As always, we encourage people to report anything suspicious to law enforcement by calling 9-1-1.